Harry Toffolo should be fit to play for Posh at Chesterfield. Photo: Joe Dent/theposh.com. Manager Graham Westley believes Peterborough United’s form will help them in their quest to win promotion from League One. The Posh boss was thrilled with his side’s display when holding Premier League West Brom to a 2-2 draw in a fourth round tie at The Hawthorns last Saturday (January 30). 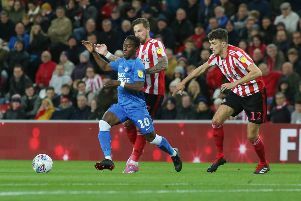 Posh came from behind twice in the final 11 minutes with goals from recent signing Shaquile Coulthirst and substitute Jon Taylor to force a replay at the ABAX Stadium next Wednesday (February 10). And he believes a repeat of the spirit on show on Saturday will soon see Posh climb back into the League One play-off places. Posh are currently 10th, but only three points off the top six ahead of their trip to Chesterfield on Saturday (February 6). Westley said: “It was a good performance at West Brom, and it was also an encouraging one as far as the rest of the season is concerned. “To come back twice against a high quality team like West Brom is not easy. “To do that you not only need quality in your squad, you need to have good character and a lot of heart. “The quality of our players has never been in doubt and now nor should their desire and commitment. “Our young players will take a lot from the game at West Brom. It should give them the confidence to perform even better in League One. “Like most games in League One if we play to our very best at Chesterfield we will win. “But Chesterfield away is a tough game for a variety of reasons. “They had a little boost when Danny Wilson took over as manager over Christmas and now he has added his own players to the squad. Harry Toffolo should return to the starting line-up at Chesterfield after missing the FA Cup tie at West Brom with a whiplash injury.